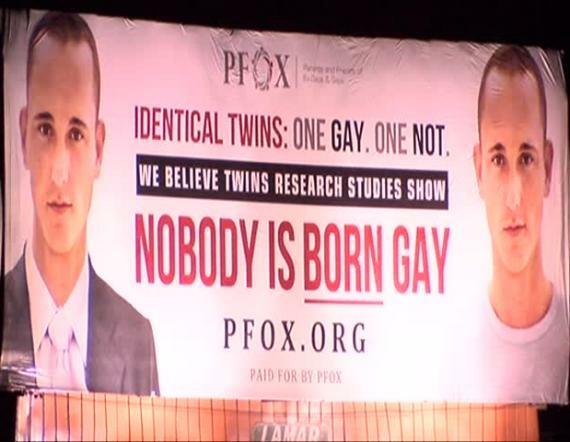 A PFOX anti-gay billboard in Richmond further demonstrates that Regina Griggs (head of PFOX) doesn't understand science. Regina Griggs is very, very upset over a movie that she does not like. The leader of the group Parents and Friends of Ex-gays and gays has penned Hollywood Erases Hope. The movie that Griggs doesn't like is Boy Erased. Those are three professional anti-LGBT religious zealots who are also lacking in mental hygiene. As for Ms. Griggs, she has many problems telling the truth. It has been some time since I took notice, However, in 2009, the CDC released a report that gay men accounted for 71% of HIV infections in 2005. Griggs then said that 71% of gay men were HIV positive. A year later, Griggs claimed that a Washington judge ruled that homosexuality is not immutable. In spite of numerous people correcting the record (including me) she repeated this over and over again. What the judge actually ruled was that immutability was not required for protection under Washington, DC's Human Rights Act. Stupidity, mendacity or (likely) both? Making matters worse is the fact that Griggs has an openly gay son who wants nothing to do with her. They know there is no peer reviewed research on therapeutic change that supports them. They also know that at least one of their therapeutic methods (i.e., cartharsis [sic]) has been evaluated via research and found to be harmful in some instances. They also know that their narrative regarding homosexuality (i.e., failures in the parent-child relationship) is scientifically dubious and yet they continue to promote this view as if it is supported by research and experience. Why not frame it that in 14 states, children are protected from ineffective and potentially harmful practices that have no scientific support? Mr. Sprigg works for a rabid hate group (Family Research Council). Peter Sprigg is unqualified — he is a Baptist pastor. Mr. Sprigg's conclusions are not based on reputable peer-reviewed research. The one study published to a respected academic journal (Spitzer) was retracted. I have no idea whatsoever why Griggs would write that. Is she confused by “art-house horror movie” or “obtuseness?” We will never know. Mr. Sprigg read the book on which the film is based and went to a screening. He concluded that the book was more truthful in revealing pre-counseling motivation and trauma experienced in real life by Garrard Conley, on whom the film’s “Jared” character is based. But even in the book, Mr. Conley misconstrues therapeutic programs. I have not read whatever Sprigg wrote on this subject. Nevertheless, these are not “therapeutic programs” because they lack proof of efficacy. Referencing “trauma,” the intent of Griggs (and probably Sprigg) is to convey the idea that a sexual orientation they do not approve of is caused by external events. They usually refer to this as “the root of the problem.” Their problem is that it (homosexuality) is not a problem because of religious disapproval and there is no science to support their problematic theories. Moronic parents instill the shame. “Reparative” practitioners exploit the shame. Love in Action was renamed Restoration Path in 2012. It is a Christian ministry engaging in pray-away-the-gay. Gay people do not need to be restored. Note that the second item expresses homosexuality in the past tense. Love and acceptance are predicated on changing from gay to straight. Calling a sexual orientation a sexual addiction is just plain stupid. Similarly, the third statement about worth, intelligence, etc. is based on impossible change. In other words, as long as they admit to being gay, they do not have worth and they are not “caring and strong.” Shame and the anger of their god are the only motivational tools known to these people. Inevitably a parent will ask: “Don't you want to have a family someday,” implying choice. Sprigg knows that he is lying and Griggs knows that Sprigg is lying. Conversion therapy is based on shame. The shame is removed only when people profess to be heterosexual or cisgender. In 2015, Jews Offering New Alternatives of Healing (JONAH) was found in violation of New Jersey’s consumer fraud law over JONAH’s referring people to reparative therapy counselors. The judge hamhandedly suppressed evidence. Stating that no one can possibly change his or her sexual preference, the judge disallowed testimony by successful clients. The far-left Southern Poverty Law Center had brought the case, which put JONAH out of business. If scientific, technical, or other specialized knowledge will assist the trier of fact to understand the evidence or to determine a fact in issue, a witness qualified as an expert by knowledge, skill, experience, training, or education, may testify thereto in the form of an opinion. There simply are no proponents of conversion therapy who would qualify as expert witnesses (eg Mr. Sprigg) and most states adopted either the Frye or Daubert standards. Furthermore, Griggs referring to “sexual preference” does not make it so. Sexual orientation is not a preference which implies choice. Boy Erased even shows family members beating a young man with a Bible. Like everyone else, people caught up in homosexuality need to know they are loved and that our sins -- of any kind -- should not be our defining identity. Griggs is a bigot and she cannot help herself. People are not “caught up in homosexuality.” Sexual orientation is a continuum with gay and straight at the extreme ends. Every point along the continuum represents a natural variant of human sexuality. The fact that people call some of these variants sins, based on ancient chronicles, is irrelevant to scientific fact. Gay people do not need to be “washed” or to repent for the hand that nature dealt them. If there is a god then Regina Griggs better repent for all of her lies and for all of harm that she has done. Now I will ignore this moron for another few years.